Welcome to Empire Gymnastics Center! Give us a call at 916-644-3035 or visit our website, www.empire-gymnastics.com, for more information regarding class descriptions, instructors, schedules, parties & more! I, (we) despite all reasonable precautions implemented for safety, am (are) fully aware of and appreciate the risks, including the risk of catastrophic injury, paralysis and even death, as well as other damages and losses associated with participation in the programs or activities. I (we) knowingly and willingly assume all such risks. Consequently, I (we) hereby for myself, heirs, executors and administrators, do waive and release any and all rights and claims for damages against the owner, operators, coaches and any other members of Empire Gymnastic Center ( the releasees) from personal injury or accident of any sort or nature suffered by me (us), the undersigned, by reason of participation or membership in classes, lessons or any programs or activities of Empire Gymnastics Center. I, the minor's parent and/or legal guardian, understand the nature of these activities and the minor's experience and capabilities and believe the minor to be qualified, in good health, and in proper physical condition to participate in such activity. I hereby release, discharge, covenant not to sue, and agree to indemnify and save and hold harmless each of the releasee's from all liability claims, demands, losses, or damages on the minor's account, including negligent rescue operations. I further agree that if, despite this release, I, the minor, or anyone one on the minor's behalf makes a claim against any of the releasees named above, I will indemnify, save, and hold harmless each of the releasees from any litigation expenses, attorney fees, loss liability, damage, or cost any may incur as the result of any such claim. Class fees are charged monthly. If enrolling during the middle of an ongoing session, the class will be prorated. There is a $50.00 registration fee that will be applied once a year. 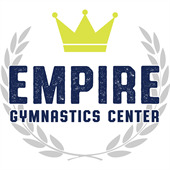 Empire Gymnastics Center requires a 30 day written notice when dropping a class. The 30 day notice must be given before the 15th of the month when tuition is billed or the family will be responsible for the following months tuition. Notice must be provided in writing or email. An additional $10 late fee will be applied to accounts that are 10 days past due on their account.